Ever have tuna salad without mayo? My version involves avocado, lime juice and crunchy, fresh vegetables. 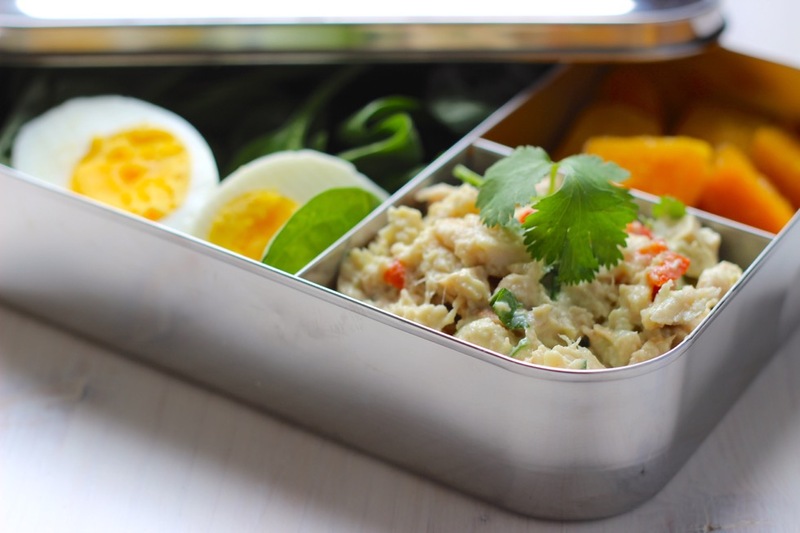 Since today is #EarthDay, it’s fitting that this easy and healthy tuna salad recipe came from a scavenger hunt in my fridge. I had some leftover avocado and a vat of Greek yogurt that was a few days past the “sell by” date. I’ve learned that those dates are quite conservative especially on yogurt – which seems to last forever. That’s another story. I’m here to talk about lunch. On the days when I do have to pack a lunch, I take the easy way out with a PB&J and yogurt, black beans and salsa or again, leftovers. When thinking about this month’s The Recipe Redux theme, Limpin thru Lunch, I had all of these grand ideas that would be tasty – just not portable. And I wanted to share something portable – if for no other reason than to use this adorable lunch box I recently got. Don’t you love a compartmentalized lunch box? I grew up eating tuna salad at least once a week. It was chunk light tuna drenched in mayo with a heaping dose of relish and boiled eggs and served on Merita white bread. That, My Friends, is traditional southern tuna salad. Convincing folks that tuna salad without mayo is worth the time it takes to open a can is a challenge but it’s good to to switch it up. For this version, I swapped the mayo for a tangy lime avocado sauce and added some aromatic vegetables for color and crunch. 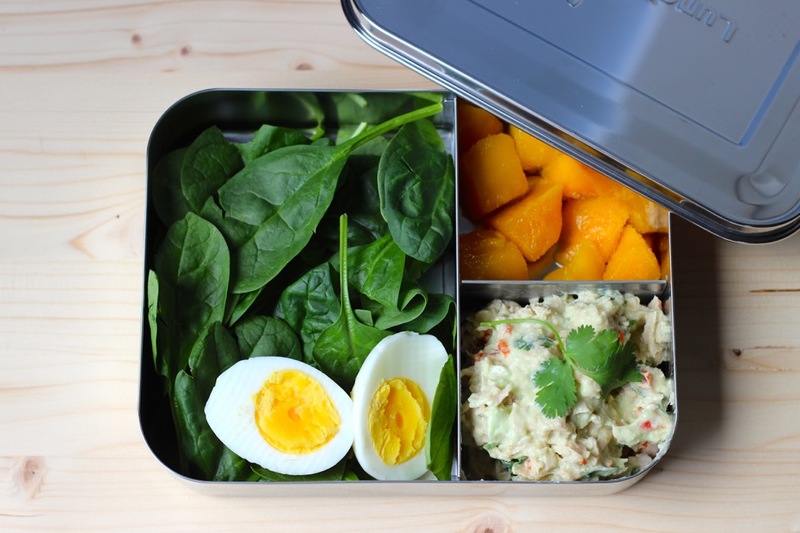 Because I like the experience of exploration at lunch, I left the boiled egg off to the side and served the tuna with a side of fresh spinach and sweet mango. I actually mixed the mango into the tuna salad near the end and I’m pretty sure that’s how I’m going to enjoy it any other time I make it. So I guess I actually made Mango Avocado Tuna Salad? Kinda. If you’ve been limpin’ through lunch, consider it over. Check out the recipes below and follow #TheRecipeRedux on twitter and Instagram for at least a hundred healthy lunch ideas over the next couple days. In a small bowl, break apart the tuna with a fork. Mix in the avocado sauce. Add the red onion, bell pepper and cilantro. Toss to combine. Sprinkle with salt and pepper to taste. Complete the meal with a little fruit and greens on the side or mixed in. I enjoyed it with mango, spinach and a boiled egg on the side for a protein rich lunch. 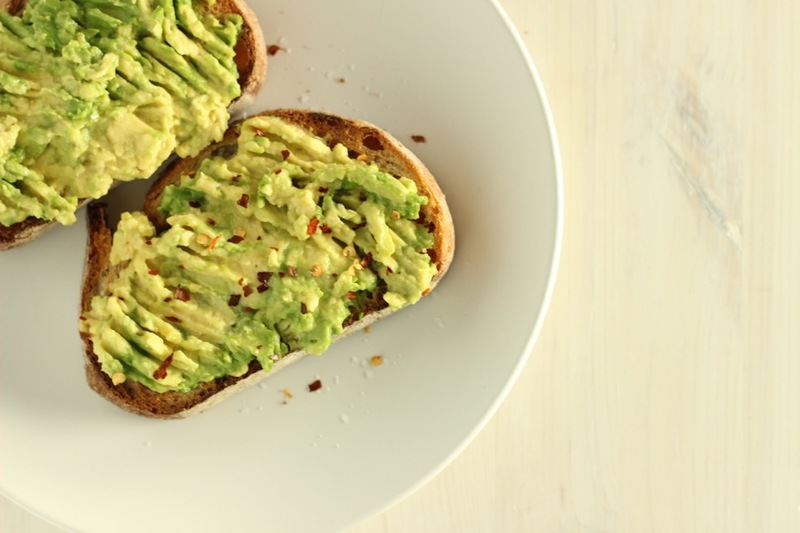 « Should You Start Eating Avocado Seeds?